When Ray Bengen learned that he was going to start work at the New York Times new Eighth Avenue office tower back in July as a software engineering consultant he thought, "Great. It’s just up the street from where I live. I can ride my bike to work." There was just one problem. While the Times and developer Forest City Ratner were promoting their new Renzo Piano-designed skyscraper as a "technologically advanced and environmentally sensitive" exemplar of green construction, a lack of bike parking and policies hostile towards cyclists were discouraging employees from commuting to work by the city’s most environmentally-friendly mode of urban transport. "I couldn’t believe they built such a supposedly ‘green’ building without a bike room," Bengen said. "This isn’t exactly the best neighborhood to leave a bike outside all day." For a few weeks a friendly security guard allowed Bengen to bring his "cheap old Giant" bicycle into the building through a freight elevator. Then one day in September the guard said that he wasn’t allowed to do that anymore. "It was very annoying," Bengen recalls. He wasn’t the only one who felt that way. Since May, bike commuting Times employees have waged a campaign of "genteel agitation," as one staffer described it, to secure a bit of space in the 1.5 million square foot building to store their bicycles. 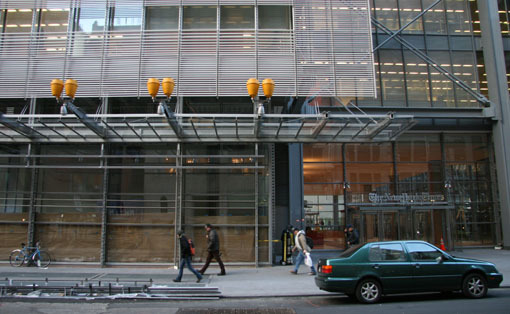 Last week, after months of frustration, the issue nearly boiled over into physical conflict as Times employees began locking their bicycles to the circular perforations that Piano conveniently designed into the steel girders running up along the outside of the building (pictured right). "Building security wanted to cut the locks," a Times employee who wishes to remain anonymous said. "They were looking for the clippers when Jay McKillop, the head of Times security told them, ‘Chill out. Wait a day or two.’"
McKillop suggested waiting because on Tuesday building management finally opened a small indoor bike parking area near the trash compactors. It will provide a total of 20 parking spaces, 12 for the Times and 8 for employees of other companies in the 52 floor building. Employees will need a permit sticker on their bike and space will be allocated on a first-come first-served basis. The new arrangement is far less bike-friendly than that of the Times’ old building. There, employees parked their bikes in a long hallway on the ground floor near the cavernous old printing press room. "With nice weather there would be 40 bikes there," the Times employee said. "There were two or three bike racks and this ballet bar that ran about 40-feet down the hallway for locking up." On a typical day one might find about 20 bikes locked up down there, a few of which had clearly been abandoned. Despite repeated assurances from company executives that the new building would have an indoor bike storage space, as employees began moving into the new offices last spring, the bike parking never materialized. "I started taking my bike up the freight elevator and at a certain point the security guys stopped me from doing that," a second anonymous Times employee said. Forced to lock up on a Midtown sidewalk he found that "people were messing with my bike — a napkin shoved into the derailleur, the shift levers would be moved. It was silly stuff. Nothing damaging. But it made me worry about my bike." Bike locked to building: Problem. Illegally parked Volkswagen with press pass on dashboard: No problem. With nowhere to park, some Times employees stopped biking to work altogether. Pulitzer Prize winning reporter Jim Dwyer commutes by bike along the Hudson River Greenway from his home in Washington Heights four or five times a month. Since moving into the new building last summer, "I don’t commute at all by bike because of the hassle with the parking," he said. Dwyer warns that unlike the newspaper itself, when it comes to Times water cooler gossip, "this is a place where authoritative misstatements are commonplace." Still, quite a few other Times employees suspect that the lack of bike parking was due to some sort of screw up that management refuses to acknowledge. Bengen said his friendly security guard told him that "the building was supposed to have bike parking in the basement and a library on an upper floor but Renzo Piano and company miscalculated the load bearing capacity of the upper floor and it wasn’t built with sufficient support for books so the library was moved down to the basement where the bike parking was supposed to be." Another Times employee said construction workers told him that a bike parking facility had been installed and later removed. All of which "is absolutely false" according to Abbe Ruttenberg Surfos, New York Times Director of Public Relations. So, why didn’t the Times include a bike parking facility in its original design? Ruttenberg Surfos, Renzo Piano and developer Forest City Ratner all declined to comment. Providing bike storage, shower and changing facilities for five percent of a building’s users is generally considered one of the easier ways to earn a LEED certification point from the U.S. Green Building Council. It takes 26 points to earn LEED certification. (Download the LEED guidelines here). "It’s an interesting bit of gossip in the green building world that the Times building isn’t LEED certified," Jackson Lehrer, an Associate at consulting firm Green Order, said. "It’s a good green building but at the time they were designing it they didn’t have the foresight to pursue the label, not realizing LEED was going to be as important as it has become." "To be fair," Dwyer said, "the things that this building does in terms of conserving energy and reducing emissions are significant." The new building is wrapped in a "second skin" of horizontal ceramic rods that deflect the sun’s heat and save on cooling costs. Indoor lighting and shading systems adjust automatically to a room’s occupancy and the sun’s glare. Ceiling panels are made of recycled materials and the carpeting used throughout the building was manufactured using minimal chemicals. And a 1.4 megawatt, on-site natural gas generator supplies 40 percent of the building’s power, reducing electricity cost and waste. "It’s a very nice building," that first anonymous Times employee agrees. "But most of these green features have nothing to do with personal comfort. They just save the building money." That being said, he notes, "The old building was a rat hole. Anybody who is nostalgic for that is blind." 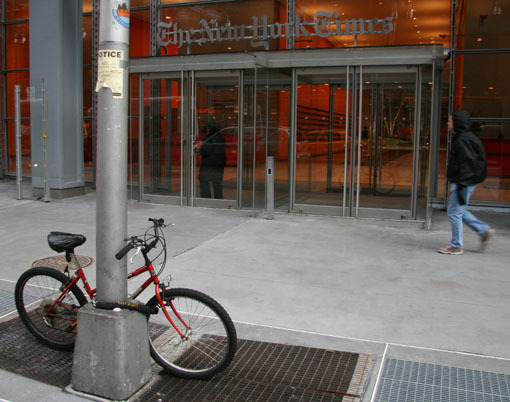 I want to make a report about riding bicycle in NY and I hope you can provide me the picture of a bicycle parking in front of the NY Times but I can’t afford paying you. You will be credit of course. I have a solution for you and the NY Times building. Contact me so that I can find out who to approach there with my proposal. Does Times Real Estate VP’s “Joke” Betray Anti-Bike Bias?